In a world of constant digital dialogue, Angela and Ashton’s initial meeting feels quite retro, a throwback to the old school as it happened in real life and by chance. Angela was out for a night at the bar in her hometown of Kansas City, Missouri with her girlfriends when Ashton, visiting from Chicago, showed up with a crew of his own. Big world, small network, so naturally some people from each of their friend groups knew each other. The two groups mingled together and that’s when Ashton was stunned by beautiful lady in a red maxi dress and a full fro. At the time, Angela had a boyfriend and plans to relocate to New York in the fall so sparking a flame wasn’t in the cards. Years later, the two reconnected. Ashton moved to New York and they’ve now been together for two years residing in Brooklyn. 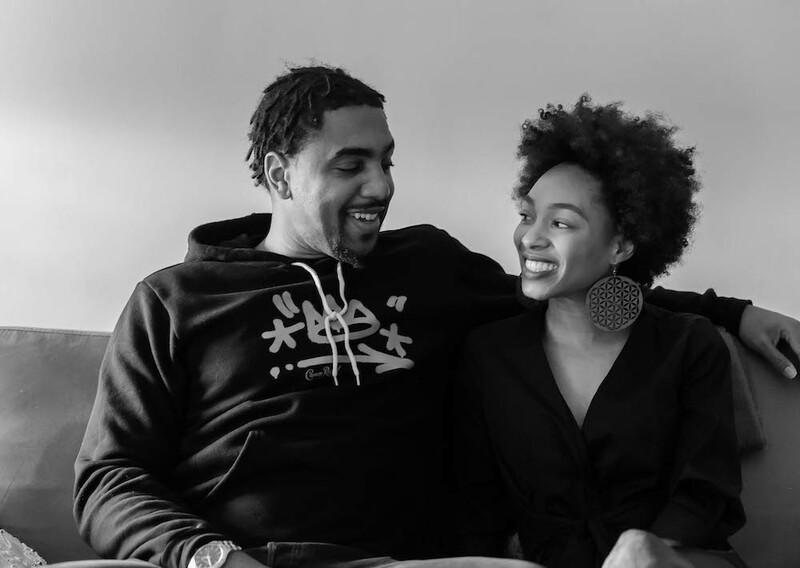 What does black love mean to the black community? Ashton: I’d like to say it’s the fundamental aspect of where we derived from, it’s probably what propelled our people to where we are today. We dealt with so many different things, if it wasn’t for the foundation which was man and woman in the black community striving and pushing generations forward, who knows where we would be right now. Angela: I would say love to the black community is survival. It’s how we survived slavery. It’s how we survived being brought from our homeland to some unknown place. It’s how we survive the lack of civil rights and it’s what brought us to where we are today. It allowed us to love through the absence, love through the killing, love through the disrespect and even loving our children so that they can grow up and go forth. What representation of commitment did you have in your life to model after? Angela: My family was very close. Growing up I came from a two parent household and I always did strive towards that. My grandparents had been together so long so I did see a lot of relationships and as I got older I realized those relationships weren’t healthy. I wanted to change that, I was very much aware that what I saw growing up, a lot of those same couples split up and for me it was crazy. All these years and all these people are breaking up. It really sparked in me a fire to want to create a different atmosphere for my children and create a new generation that was able to express a healthy relationship. Ashton: I can’t really say there’s been a relationship that really inspired me to say I want to get married and have kids. I come from a two-family household and my grandparents were married, there’s a lot of things I didn’t want to mirror. I didn’t really see that love, I saw a relationship. I saw the expectations of what should be but I didn’t see love acted out. I feel like it’s on me to not pass that down to the next generation by thinking about what do I need to sacrifice to have that healthy relationship. Unfortunately, in the black community, we haven’t had time to sit down and really look at PTSD, anxiety, all these things we’ve battled and it’s the reason that we don’t have a lot of healthy successful relationships. It’s not necessarily the individual, it’s what we battle with in society and we bring home. You know, when you have mothers and fathers working two or three jobs to keep the lights on. It’s hard to take the time to think about self. How did you know you were ready to commit to each other? Ashton: It got to a point where I knew, see I’m 34, it’s not like I was getting out the game at 24 or 25. I thought, do you want to continue to waste time aimlessly or do you want to invest and have something of substance? That’s what this comes down to. For me it just worked, it clicked. I knew that if I was ready to do that internally there would be some things I had to work on in order to have a successful relationship. Angela: I was in New York and I had been here for several years and I had been dating. When I first moved here I wanted to take time to be single, I was intentional about the time I spent alone and not dating. I was at the point where I was ready to be in a relationship but I also wasn’t trying to force it or think about it too hard because dating in New York is so tough. I had just kind of accepted that it may or may not happen and it is what it is. I was ready to settle down but I wasn’t thinking that it would happen anytime soon because of my location and my experience. When he came back around I was shocked, but I was excited because I always believed he was the one who got away. I almost didn’t believe it at first, but it worked out perfectly. As we were spending time together I was like, I’m ready to do this, let’s do it. What’s the hardest part about being a millennial in a relationship in today’s society? Ashton: Generations before probably had stronger examples of what it takes to be successful in a relationship without having so many exterior distractions. Obviously we don’t know what all they were dealing wit, but they just weren’t divorcing. They were like, we gonna figure this out. It’s a microwave society so everybody’s used to instantaneous gratification so when they deal with stress or pressure the reaction is I don’t want to deal with this. I feel as if the generations before were dealing with a lot of BS but they also believed that was a part of the process of being married and they didn’t look at it as a burden. They knew that marriage is seasonal, it has its ups and downs and that was the expectation. You’re not going to go into it and always have perfect days but you have to have that willpower to make it through. The disconnect is, a lot of that wasn’t transferred down to younger generations. Angela: I think the hardest thing is unlearning what was passed down to us from our parents. In my experience, I was one of the only people in my friend group with parents who were still together and my parents separated around when I was 20, that was the reality for a lot of people in my generation who did have both their parents. Unlearning a lot of what we saw growing up: the non-communication, hidden infidelity, or abuse. Unlearning those negative things that our parents passed down to us because they were trying to stay together for the sake of the kids. There’s so many mixed messages, we see our grandparents who’ve been together 50 years but we also see our parents who have been together 25 years and we know that daddy was cheating on mama or vice versa and they just stayed together to stay together. Now we have more options, especially as women, we don’t have to stay because our husband is the breadwinner. So it’s like, I’m not sure what messages to keep or not keep. Do I want to deal with the same things? Do I want to deal with infidelity at the sake of staying together? When do you draw the line? Do you feel like at your age you were ready to share a life with another person? Ashton: I think, so but it takes a strong person who is comfortable with really looking at self a lot. When you spend time worried about another person and how you don’t measure up, ultimately you can only control you. You’re praying the other person will coexist well with you. But when you get to that mindset where you’re really ready to focus on self and what you are contributing to the next level, that’s all you can really do. If that other person is really willing to be there with you and say I want to do the same, to me that’s how it’s successful. Nitpicking and looking at what this person isn’t doing, that’s setting yourself up for failure. Angela: Once you get to the point where you realize that two imperfect people are going to come together and this is what we have. It’s all about vision and intention. You and your partner have to have a vision and know where you’re trying to go. Two people have to come together and say, you’re imperfect, I’m imperfect and we’re going to take our two imperfect selves and strive to be the best we can be. Ashton: Honestly, I don’t want to put any expectations on it because that sets up a false reality. I’m the oldest of three boys so I’ve always been in that mindset of putting someone else first. My parents passed, so it was even more of a mantle on me to be the head and think about what kind of example am I setting. I translate that to our relationship and always trying to be cognizant of when I drop the ball it doesn't just affect me, it’s affecting her. Even down to the little things. So when we’re having conversation and she’ll say something that I said or did, I always have to check myself by putting myself in her space. Like, how did that affect her? A comment just isn’t a comment, it’s a comment I put out there and it’s affected her. It’s humbling. I talk to my bros who are married and they’re like, you have no idea, you may think you know but you don’t know until you jump in the water, it’s a lot colder than what you thought it was. I’m excited about what’s capable of happening from our marriage and changing the trajectory of my family legacy. There haven’t been that many successful marriages in my family. I want to raise kids in a household where they’re happy, they’re loved and they don’t feel like they’re walking on eggshells. They’re cognizant of their complexion and their history. I know I’m capable of that. Angela: My expectations are, one is that we put the Lord first and that we serve God first and I feel like that’s something in the successful relationships that I do have around me that is a main factor. I really want to create that loving environment. I had that from my mother but not from my father even though he was there. My main thing is that we are committed to each other and we are putting God first and we are encouraging each other to be the best versions of ourselves. One of the things that we talk about now is that I am selfish, that’s been a big thing for us. What I love though is that he has put this mirror up to me that I’ve never had before. I think that we are starting to get to a point where I’m like, Okay I am selfish, let’s work through this. We’re unlearning very toxic behaviors and characteristics. To be able to do that together and to everyday choose each other that’s one of the most exciting things to me about marriage. You can go through this world alone, you can do anything, you can raise children alone, but having that person there to say everyday I choose you, I choose this relationship, I’m going to choose to make this work. It’s empowering. And it makes me want to be a better person to him, to my future children. If you could sum up love in one word what would it be and why? Ashton: Determination, you have to be determined to be committed to love, love is an action word. To me as a man, you have so many temptations that you fight on a daily basis that have nothing to do with that individual. But that barrier I feel that is love is constantly in the back of my head. Those temptations are always there tugging on me but that love aspect is always helps align me on my goals and the path I want to take in the future and that legacy aspect. If you’re really about this life you gotta be determined to be committed to it. Angela: I would say love is commitment. Love is an action word, it’s a verb, and you have to be committed to sacrifice, committed to the struggle, committed to taking those steps. You don’t get to say I love you and not be committed to that person. You love your kids, you’re committed to them. You love your spouse, you’re committed to them.